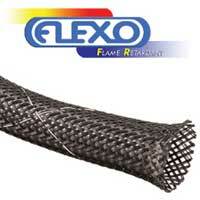 Flexo®:: PET Flame Retardant (FR) sleeving is the perfect choice for electronic and high tech applications where flame retardance and durability are primary concerns. Ease of installation makes FR an efficient choice for long runs of wire or cable. Flexo Pet FR available colors: black, gray, white, with tracer.